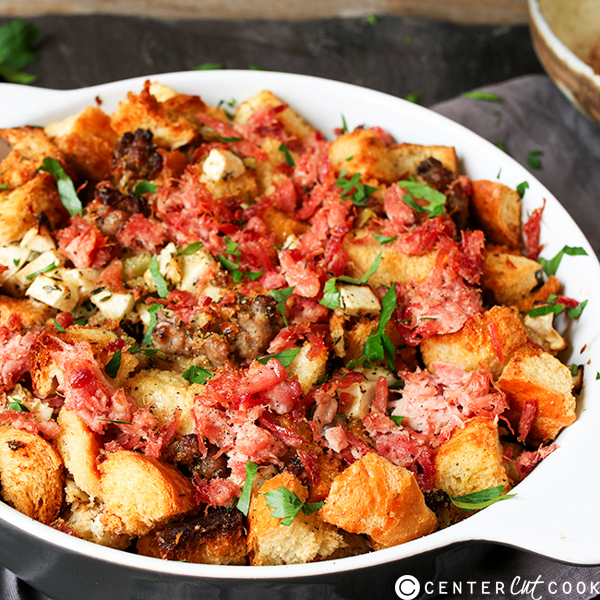 A delicious 2-meat stuffing that’s crunchy on top and tender underneath. A Thanksgiving side dish that’ll have everyone going back for seconds! If you like homemade stuffing that’s crunchy and crisp on top, soft and tender underneath, and packed full of flavour, then this is the one for you! 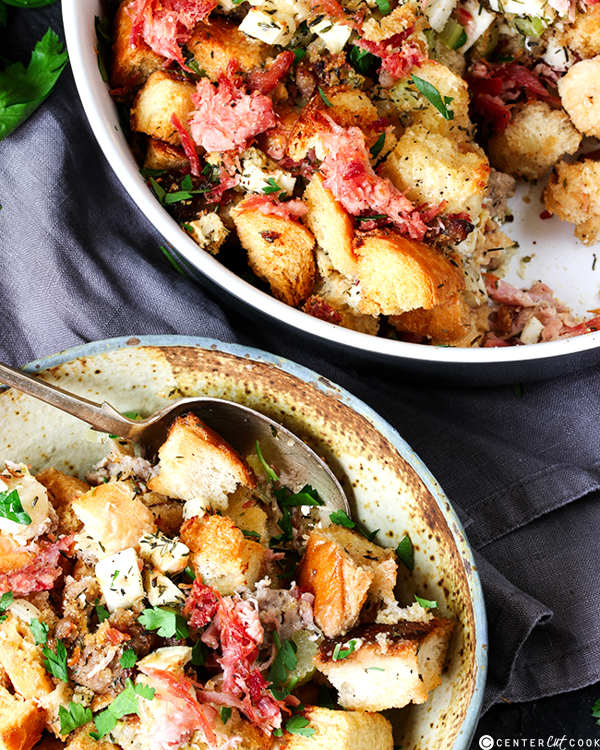 By itself as a regular sausage, herb and bread casserole, this is delicious, but add the apple and shredded ham and you’ve pretty much got a meal in itself. The sharpness of the apple works really well with the saltiness of the ham. I tend to use Bramley cooking apples, but something like Granny Smith’s apples work well too. I like to make this with chunks of bread that have been pre-cooked for extra crunch factor, but if you like your stuffing softer, then you don’t need to cook the bread beforehand. You can also add another cup of broth if you like it extra soft underneath. 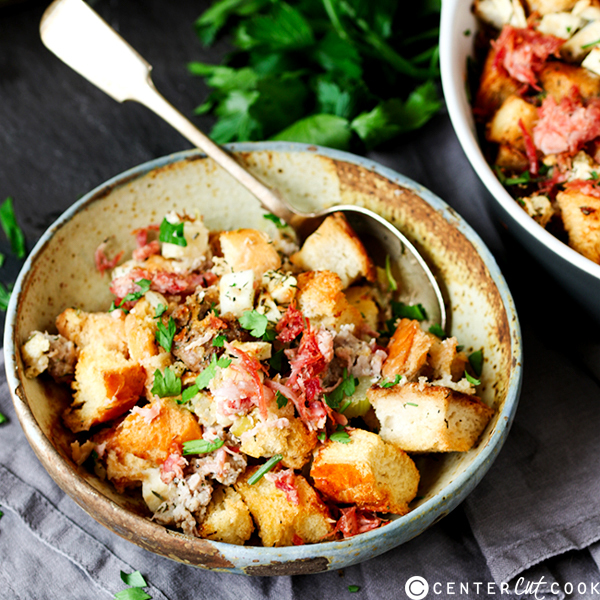 Serve it up as a Thanksgiving side dish that will have everyone going back for seconds! Preheat oven to 350f. Place the bread in a single layer on 2 baking trays and bake in the oven for 7-8 minutes until very lightly browned. Put to one side. Melt 1 tbsp of the butter in the same skillet, then add the onion and celery, cook 6-8 minutes or until tender, stirring occasionally. Transfer to the bowl with the sausage. 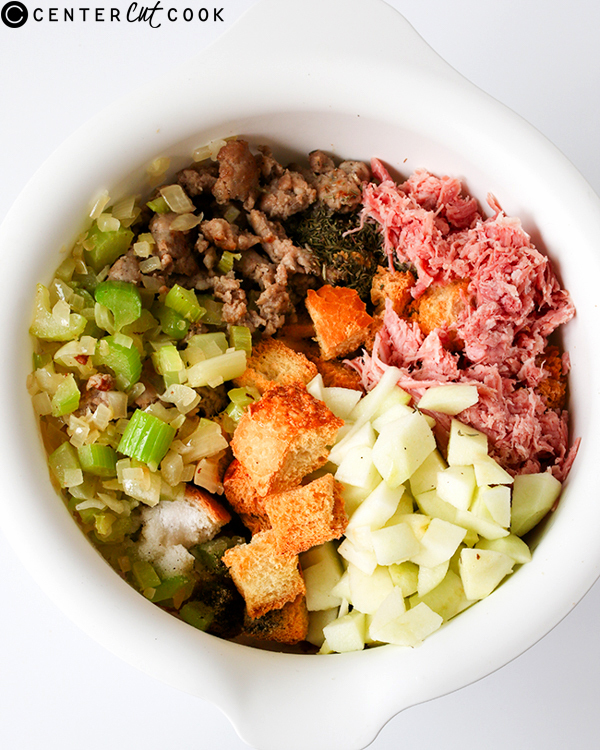 Add the bread to the bowl, along with the chopped apples, half the ham, thyme, salt and pepper and mix. Transfer to a 13 x 9-inch or an 11-inch (diameter) round baking dish. In a separate bowl melt the mix the chicken broth, milk and egg. Pour over the bread mixture. Then dot with the remaining butter. Cover with aluminium foil. Bake at 350f for 25 minutes. Remove the foil and cook for a further 15-20 minutes until browned. Sprinkle on the remaining ham and cook for a further 3 minutes until heated through.